You are currently browsing the Dublin Event Guide weblog archives for June, 2017. Lately, whenever you get the Dublin Event Guide before Saturday afternoon it means that I am travelling somewhere or taking part in a course. When that happens, it is a major operation to get the weekly e-mail magazine compiled one or two days earlier and it has an impact on every other day of the week. See, I have a day job that also keeps my quite busy and that pays my salary and then I have another near full time job at 35 hours per week (that’s the Dublin Event Guide (for Free Events)), but that second job doesn’t pay me a cent. So, in order to pay my bills and buy food, I need to work hard on the first job and the second job has to come second. Maybe, one day, I can turn the second job into a money generating job (ideas on a postcard to me, please!! ;-) ), then I will start working on it a few days earlier and you will get the finished result on a Friday at the latest. Donations is a big worry at the moment, to be honest. This is the last week of the month and this month I only got EUR 60 in donations, but I need EUR 240 to pay the Dublin Event Guide bills. That is not looking good. If I can’t cover the bills every month but have to dip into my salary (or savings), then the future is wobbly. If you can, please help via PayPal here ! The Dublin Event Guide needs your continued help in two areas: Your donations help paying the bills for sending the Dublin Event Guide every week. Just 1 Euro per month (12 Euro per year) would be great, more would be even better. Unfortunately not many subscribers are prepared (or able) to help, so please don’t rely on others! Your money will be used to pay the monthly EUR 235 bill for sending the newsletter using MailChimp, for web hosting and domain names. I am happy to work 35 hours on the Dublin Event Guide every week without making anything from it, but for the bills I need your help. You can make your donation at www.perfectresults.info/donate.htm using Paypal or CreditCard or send me a mail at dublineventguide@gmail.com if you prefer to pay by bank transfer. Corporate or enterprise sponsors are very welcome too and will get a bundle of benefits as a thank you for their donation, contact me on sponsorship@dublineventguide.com to discuss the details. This is how it works: The company you buy from will give a small commission (5-8%) to the Dublin Event Guide as a thanks for pointing you in their direction. This might only be 30 cent a go, but if many of you did it every time you buy something online, then it could make a big dent into the EUR 235 needed. Importantly, you do not pay more, but the merchant accepts a slightly smaller profit. So clicking on these ads is helping everybody! Thanks! This week I have a short video for you. It is from some Miss World or similar event, where one of the candidates had soooo much more fun that the rest. She really lived the “dance as if nobody is watching” lifestyle! What do you think, could you sometimes have a bit more fun in life by being like “Miss Netherlands”? Go for it! Dance! Sing! OR do something else that you have been afraid of doing before because you think other people will disapprove! Life is short, so don’t postpone! This week only Belinda B and Odhran K were so great to help! Thank you! Your help is much needed and VERY much appreciated. The cost for sending the weekly newsletter is approx. EUR 240 per month and a donation from you of just EUR 12 per year will ensure that I will be able to pay the bills. Cristina B, Pat M, Matija H, Rita B, JB M, Maria F, Endija S, Catriona D, Ailish B, Leigh P, George K, Miriam L, Mona O’R, Helen B, Justin M, Susan F, Deirdre G, John F, Melanie B, Mark G, Martin O’Malley, Andrew G, Ornaigh G, Noel N, Serena F, Eamonn U, Gerard Ph, Fiona F, Gabriel K, Aislinn T, Barry M, Trudi C, Eugene G, Marc F, Susan H, Grainne O’S, Edita M, Joan S, Daire OC, David P, Anne H, Irene C, Comet Records, John F, Daniel E, Olivia C, Nora O’K, Joan S, David O’K, Tara R, Keith Y, Valentina S, Clodagh O’C, Philip W, Nina J, Michael McS, Trevor J, Edmund G, Ann McP, Noelle H, Adrienne L, Michelle M, Stephen S, Darren McG, Jutta B-S, Geraldine R, Ciara L, Melanie B, Finbarr McG, Catherine E, Paula Ralph, Orla C, Amanda O, Catherine G, Arthur D, Moira dF, Juliana AY, Elaine K, Ann M, Mark G, Julie Anne O’B, Bridget W, Sean S, Karen A, Melanie M, Zelie McG, Lisa H, Tim O’N, Isidro G, Laura B, Shane M, Brian McG, Shai C, Margo C, Majella M, Tania Z, Barbara Q-B, Sueanne O’H, Cornelia K, Kevin R, Liz D, Amanda O, Carmel M, Sinead W, Julia B, Rebecca T, Margaret M, Kay G, Darragh D, Carmel C, Derek S, Clodagh O’C, Bernadette B, Ellen B, Cristina B, Breda K, Mary K, Siobhan M, Jan K, Sean O’C, Bernice McM, Raymond M, Henrieta P, Albert McC, Marion K, Barry McD, Oisin B, Rita B, Fiona R, Rachael McC, Tara R, John F, Yvonne K, Katie D (Paperbear), Celina V, Ali McD (Fitality), Catherine G, Catherine F, Dean R, Colum F, Fiona D, Aoife H, Nicola W, Mary C, Valerie W, Pauline R, Sophie P-L, Sinead NiC, Gerard K, Milena V, Richard P, James E, Valerie A, Susan B, Sharon K, Michelle McN, Anita W, Ciara T, Noel R, Bill G, Lisa C, Catherine O’S, Tim O’N, Michael McS, Adrienne L, Niamh O’C, Retrogaming.ie, Danijel S, Noelle H, Barry O’H, Marcus H, Brendan M, Eric F, Caoimhe Ni M, Daniel Le G, Gordon S, Deirdre C, Mark G, Aishling B, Ana R T, Ann Marie S, Gerard B, Luz McC, Nicola R, Caitriona D, Eva B, Ann C, Jutta B-S, Moira dF, Roisin R, Tracey O’C, Donna M, Jessica G, David S,Brendan R, Joan S, Stuart N, Filippo G, Gergory F, Mark C, Deidre M, Howard L, Paul R, Linda McD, Isidro G, Gemma O’N, Aoife M, Anita W, Mark R, Clodagh O’C, Niamh D, Odhran K, Belinda B and Travel Agency “Project Travel” (www.project-travel.ie Ireland’s only Norway and Northern Lights Travel Experts), Arthur’s Pub (www.arthurspub.ie A classic Dublin old-style pub in 28 Thomas Street with a new and buzzing music venue that runs lots of events), the Speedfriending Ireland Meet-up Group (www.meetup.com/Events-Drinks-Talks-Dublin/) (Where you can meet lots of new people and make friends), the Birdcage Bakery & Cafe (www.facebook.com/BirdcageBakery An independent cafe and bakery in 23 Harcourt Road, Dublin 2), Cycling Campaign (www.dublincycling.ie), www.FlamencoIndalo.com (A group that supports and promotes the art of Flamenco in Ireland), www.oliviercornetgallery.com (An Art Gallery in 5 Cavendish Row), www.thepaulkanegallery.com (A great Art Gallery, on the search for a new venue), www.cfcp.ie (The Centre for Creative Practices is the the only arts centre in Ireland dedicated to connecting, integrating and promoting immigrant, experimental and emerging artists among the local arts scene and audiences). So much happening this weekend! There are community festivals (Stoneybatter Festival, Tallafest and Dundrum Festival), then there are Flavours of South Dublin & Flacours of Fingal festivals. People’s Art is happening again and it is Dublin Flea Market weekend and another really big event is the Dublin Pride Parade. I can’t make the decision for you and I won’t even around to go to any of these many events! But the list here should help you to narrow things down a bit. Did you know that Dublin has a “Castle Dracula” and that it is just a stone-throw away from where Bram Stoker, the author of Dracula’s story, was born in Clontarf? Castle Dracula is Dublin’s a very unique venue and a great show for grown-ups on a night out. Enter this incredible Irish Castle Dracula Attraction and travel back in time to enjoy a heart-thumping visit to Castle Dracula. You will meet the weird and wonderful characters from the story of Dracula and learn about Irish writer Bram Stoker, who wrote Dracula and was born beside Castle Dracula in Dublin. Brave guests journey through the dark castle tunnels, over spinning bridges to Lucy’s courtyard, up to Dracula’s lair and down to the world’s only Graveyard Theatre for a show where they promise not to bite, unless..
Castle Dracula is a really fun experience like nothing else. Shows are every Saturday evening and admission is EUR 25 per person or EUR 50 for the VIP treatment. Find out all details on www.castledracula.ie/ and you can buy your tickets via the website or you can ring 01-8512151. I have been at the show a few years ago and I really liked it and would recommend it. Lots of fun, laughter and spookiness. Castle Dracula has made a pair of tickets available for a competition in the Dublin Event Guide and if you want to win the pair of tickets, send a mail to dublineventguide@gmail.com with DRACULA in the subject line of the mail and with your full name and mobile phone number in the body of the mail. Your mail has to be with me by 12:00 on 11 July. The tickets will be for the show on 15 July. To get a Leap Card, you have to go to the website above and click on BUY. You will charge the card with a minimum of EUR 5, but the EUR 5 will not be used during the 2 weeks. The Summer Solstice is just behind us. It happened on 21 June. On that day the night was the shortest in the whole year and from Sunset to Sunrise that was exactly 7 hours. But it gets even more interesting! Because if we exclude twilight (It’s called Nautical Twilight), then the night was only 2 hours and 5 minutes long! :-O I thought that was sooo interesting that I had to share it with you! ;-) Thanks to the Irish Astronomical Society (www.irishastrosoc.org/) for explaining that so nicely. This week I am finishing the Dublin Event Guide while away in the UK visiting family. In my preparation for the trip I had saved all mails that I received from you for events in the coming week on a Hard disk for me to bring with me. Unfortunately I forgot the hard disk in Dublin and some of you who told me about events by e-mail will therefore unfortunately not find the event listed in this Dublin Event Guide (for Free Events). Apologies!! It was my mistake!! Help your fellow Dublin Event Guide readers! Did you come across some interesting or potentially interesting news about something in Dublin? Maybe a brnad new pub or restaurant opened or a once popular place closed? Or maybe you found out about a Special offer that everybody should know about? If there is anything that you think is worth sharing, send it to me at dublineventguide@gmail.com and I will do my best to include it and to reference you as the helpful finder. The Dublin Pride Festival ran from 16-24 June with the parade happening on Saturday. A Family Day full of entertainment for all ages will take place at dlr LexIcon in Dun Laoghaire. From juggling to art workshops, archaeology digs to storytelling, yoga to circus skills and a lot more, there is something available for every child. A downloadable 2-pager here lists all individual events. Admission is free to all events and no booking is required, but first come, first served will apply to most events. All events are family-friendly, but the focus is clearly on the kids. Stoneybatter is inviting to the first ever Stoneybatter Festival and they really worked hard. There are lots of events and most of them are free. The ones that are not free are marked on the website with a Euro sign. The festival begins on Friday already but the main days are Saturday and Sunday. On Saturday local businesses, museums, churches, community centres and even some private homes will be open for visitors. The pubs in the area have musicians performing and a concert (not free!) in the evening will take place as well. The Saturday events are listed on the website here. Sunday is the Family Fun Day from 12:00-18:00. Stoneybatter Street and Manor Street are closed for traffic and there will be music on the festival stage and in pubs, dance, food, street performers, buskers, talks, tours and children entertainment. The Sunday events are listed on the website here. Looks like an interesting festival and I will add it to my list of recommended events. Would you like to know more about Spanish and Latin American culture? Then come the Spanish Cultural Institute “Instituto Cervantes” this Saturday for “El Dia E”. There will be a play, talks, a Tortilla patatas competition, a food fair with product from Argentina, Cuba, Chile, Mexico, Peru and Spain, Poetry Recitals and free language classes. The Children’s Workshop “Budding Botanist – Collecting and Pressing Flowers” will take place on Saturday. Kids can get great tips and discover how to become a plant collector. They will go with the guides on an expedition through the Botanic Gardens identifying and collecting suitable plants for pressing before constructing your very own flower press. If you like you can also create some beautiful botanical designs with pre-dried plants. Admission is free, but booking is required via 01 8040319. Flavours of Fingal is a farming event at Newbridge House in Donabate on Saturday and Sunday. Between 11:00 and 18:00, there will be dog shows, vintage farming demonstrations, falconry displays, croquet coaching, sheep racing, face painting, wild air runs, Great Irish War re-enactments, horse cavalry shows, miniature traditional Irish horse shows, food villages, cattle stock competitions, live music, cooking demos and more. The complete list of events and activities is on this downloadable poster here. Admission is free and parking is EUR 5. Admission is free. Meeting point is in the atrium of the Library. Six times this year the “People’s Art” exhibition will take place this year. It is an art exhibition on the rails/fence of St. Stephen’s Green. Every year a thanksgiving and remembrance takes place on Dublin Pride Parade day in the Church of Ireland St. Audeon’s Church (the second church beyond Christ Church in direction of the Liberties). The event is organised by “Changing Attitude Ireland” and the Dublin G ay Men’s Chorus will sing at it. Because the Pride Parade starts at St. Stephen’s Green and passes by St. Audeon’s Church you have plenty of opportunity and time to either join the parade at the start or at the St. Audeon’s point. The Dublin Pride Parade, a colourful, loud, good-humoured and popular parade of the LBGT* community, will take place on Saturday and it is some experience, no matter if you are participating or watching! This year the parade will start with some speeches and entertainment at 12:00 and the parade itself will start at 14:00. The parade route will be COMPLETELY different than ever before. The event starts at St. Stephen’s Green South (go towards the Conrad Hotel or the Sugar Club to get to the right end of St. Stephen’s Green) and ends at Smithfield Plaza. A map is on the website below, but simplified the parade route is from St. Stephen’s Green to St. Patrick’s Cathedral, then to Christ Church, then passing by the Brazen Head Pub and crossing the Liffey, then to up Church Street and finally ending on Smithfield Plaza. On Smithfield Plaza, entertainment with music, drag acts and speeches and food and drink stalls will frame the post-parade party. Tallafest 2017 will take place this Saturday. It is a well established yearly festival in Tallaght for everybody. There will be a Kids Zone, Arts & Heritage events, a Create Zone, a Nature Zone, a Sports Zone and in addition there will be a Craft & Food Market and Live Stage Performances. The programme is full of activities and you should definitely check it out via the link here. Outdoor Karaoke at th Wood Quay Amphitheatre (between Christ Church and Dublin City Offices)!! What is there not to like about it!? Our good friends from ALT Events, a not-for-profit collective of event organisers and idea generators, is inviting to this unique event. There is a long songlist available via their Facebook Event Page (see below) and they will provide the Speakers and Micrphone. You just have to bring your voice OR enjoy/endure some of the Karaoke performances for fun. Drop-In Activity: Meet the Flint-Stones! Stone, especially flint, was a very important material for people living in Prehistoric Ireland. Drop in to tthe ground floor education space and meet archaeologist Dave O’Reilly to handle replica stone tools and weapons and learn more about how people living in Ireland thousands of years ago used stone to their advantage. The Dundrum Festival has been busier in previous years. But it is taking place again and that is better than nothing. On Saturday there will be music performances on the bandstand of Dundrum Town Centre from 14:00. And Sunday is the main festival day. Main Street in Dundrum will be closed and a stage will be in the middle of the street with all sorts of entertainment. There will also be street entertainers. The website is not overly forthcoming with details and the Facebook page tells you even less, but it is possible that there are a lot more festival activities than these two channels suggest. At this Silent Film Show with Live Narration and Live Music 1925 black and white Japanese silent movie Orochi will be shown. This screening will be complemented by a live narration called Katsudo Benshi and an improvised piano accompaniment by Mie Yanashita. The event will start with a short introduction describing Katsudo Benshi. “Sacromonte: los sabios de la tribu / Sacromonte: the Elders of the Tribe” is a documentary from 2014 (94 min) about the neighbourhood in Granada by the same name that is considered as the cradle of Flamenco. For 200 years until 1963, 4000 Romani lived there who all had a connection with Flamenco. The film will be screened in Spanish with English subtitles. Admission is free. Light refreshments will be provided from 13:30. The In Focus Tour “The Dragon Robe and the Twelve Symbols of Sovereignty” with Vicky Wang, Guide, Chester Beatty Library will take place. Where can you find an eel that swallowed a frog, a smelly pilot whale skull and giant fossil skeletons found in Irish bogs? Join a tour at the Dead Zoo to discover more about the history of the collections and the animals on display. Admission is free, but placed are limited. Suitable for Age 8+. There will be two tours at 14:15 and 15:30. Hip Hop Band Loud Motive will be in Sin E for a Post-Pride Parade party. The band “Cult Called Adam” will play a gig in the Harbour Bar. The Clandestinos will play a Roots Reggae, Ska and Latin gig in the Bowery. The bands “Hoddo Reelin” and “Vulture Collective” are playing a gig in the midnight hour at Whelan’s. A Children’s Workshop with Farmer Ann for children aged 6-11 years will take place on Sunday. Come along and meet Farmer Ann’s animals. 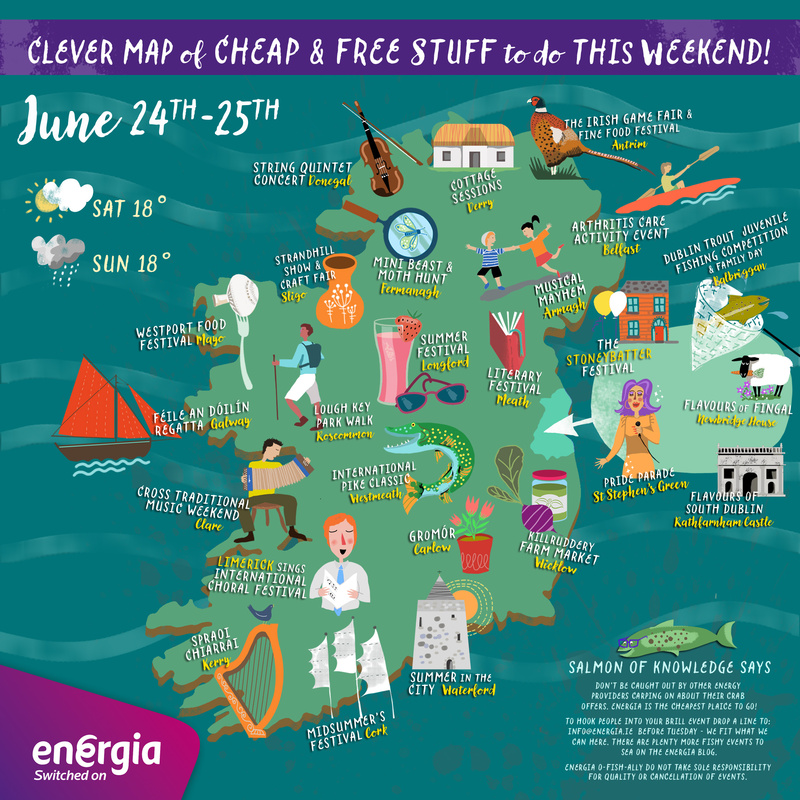 Flavours of South Dublin (sponsored by Dublin Event Guide Sponsor Energia) is a food festival that will showcase wonderful restaurants, eateries, and suppliers. Cultural elements and crafts & arts will also be on display. The festival will take place in Rathfarnham Castle and admission is free. The Rathfarnham Concert Band will play at 14:00 as part of the Rathfarnham and District Festival that is independent from Flavours of South Dublin, but also takes place at the moment. The Rathfarnham & District Festival (also known as RAD Fest) is taking place from 24 June until 01 July) and I would love to tell you more about it, but whoever is organising is, needs some serious help! There is a Facebook Page here, but the only list of events that are part of RAD Fest is on an illegible picture that can be found on that Page. Talking about making it difficult for visitors!?!?! The picture with the programme is here. There are 13 events on it, but it is not 100% clear if all these events are free. The next concert will feature Satoko Inoue playing new music for piano. More details are on the website below. The Children’s Workshop “Creative Seed Bombs”, kids will find out about the importance of native plants and make up some creative seed bombs, which can later be used to germinate colourful flowers. Don’t wear your good clothes, it will be mucky! “Francis Ledwidge: A celebration of his life, work and legacy” are talks by Dermot Bolger, editor of a new edition of Ledwidge’s Selected Poems, poet Michael O’Loughlin and artist Liam Ó Broin, for a celebration of the life of Francis Ledwidge. Born in a labourer’s cottage in Slane, Co Meath, the poet Francis Ledwidge worked as a farm labourer, a miner and a road worker while writing the poems that brought him fame during his short life. He enlisted in the Inniskilling Fusiliers in 1914. Having endured Gallipoli, Ledwidge was killed on July 31st 1917 during the nightmare 3rd Battle of Ypres. Join this tour and exploring the turbulent decade from 1913-1923 examining the ordinary Irishmen and women involved in World War I, the 1916 Rising, War of Independence and Civil War. Admission is free. Suitable for adults and Age12+. Places will be allocated on a first-come first-served basis 15 minutes before the tour starts. “The Summerhouse” at the lake in St. Stephen’s Green is the venue for the next Outfoor Bal Folk Dance session. Learn and enjoy European dances at this regular session. Max Marshall will be in Bray for a Folk Gig. “Conversations on Art” is a interactive tour specially designed for people living with dementia and their loved ones (Azure Tours). Take a break from the everyday and enjoy an afternoon of conversations on art and life in general. Admission is free. Limited to 10 Participants per tour, booking is required. Call Heidi Campbell on 01 4070766 for more information. “Jazz Time Machine: History of Jazz” is a talk with performance with Peter Moc. The weekly Stand-up Comedy Night in Bowery is happening again today. David Hynes and Danny O’Connor lead and bring a number of guests. The lunchtime lecture “The Conscription Crisis, 1917-1918: anatomy of a psychological partition” with Dr Emmanuel Destenay (Government of Ireland Postdoctoral Fellow) will take place in the National Library. Dr Destenay discusses why the Conscription Crisis must be regarded as the real turning point in twentieth-century Irish history. His research argues that the 1916 Easter Rising has been overestimated in Irish collective memory for political and cultural reasons and has superseded the importance of the threat of conscription in Ireland. Indeed, the vital question is: did the 1916 Easter Rising pave the way for the overwhelming victory of the Sinn Féin party in December 1918? This Open University panel discussion will consider the implications of Brexit on the island of Ireland. A panel of expert speakers from a range of perspectives will share their thoughts on key issues such as politics, trade, markets, peace, culture and the border. More details including a list of panel members can be found via the website below. Admission is free, but booking is required via the Meetup Site here. Historian Tim Pat Coogan will talk about the Peace Process in Northern Ireland. Imirt, the Irish Game Makers Association is inviting to an evening of talks about game design and culture, an event in collaboration with the MSc in Interactive Digital Media in Trinity College Dublin. And in addition, the Imirt 2016 Irish Game Awards will be presented. Expert Storytellers Candlelit Tales will be in Stag’s Head to tell you about “Brotherhood – Men in Fights”, an ancient band of warriors. Come and sing in French at the “Soiress Karaoke Francophone”. A very special playlist of French variété from every decade and every style from Dalida to Maitre Gims has been selected and now you just need to come along. Non French-speakers and bad singers are welcome! Songs will be from Goldman, Indochine, Claude François, Gainsbourg, Niagara, Christine & The Queens and Michel and his Connemara. The next Inn Jokes Comedy night should come up this Wednesday, but it hasn’t been advertised yet, so check the website a little closer to the day to find out more. MC and organiser is comedian Colm O’Regan. The Talk “Curating Culture: Research libraries in a digital age” with Richard Ovenden, FRSA, FSA, Bodley’s Librarian is part of a series of lunchtime talks at the National Library of Ireland that features librarians from across Ireland and Europe, talking about new perspectives and strategies for libraries as the world of information management evolves. “The Late Work of Katsushika Hokusai” is a talk by Alfred Haft, Curator, Japanese Section, British Museum. Sho is a Japanese instrument and at this lunchtime recital, Naoyuki Manabe will play the Sho. “Start Up, Start Here: Companies Registration Office (CRO) Information Evening” is an event that is part is part of the Central Library’s Business Support Programme 2017. The talk is suitable for anyone who is thinking of Starting a Business in Ireland. Bernie Byrne from the CRO will provide information and advice about: Setting up a company, Registering a business name, filing an annual return, mandatory e-filing and more. Let’s Make a Scene is similar to an “Open Mic” event for musicians and spoken word artists, just for actors, comedians and imrovisers. It is a live platform to actors, comedians, improvisers, slammers, etc… for free to present, test, showcase or display their work to an audience (scene, monologue, sketch, reading, new material or in production, etc…) and create a momentum prompting exchange & collaboration in between artists of different media sharing a passion. The event is a monthly open platform and on Thursday you will discover the work of Amy Coleman, Conor Hackett, Eamonn McNicholas, Eilis Jordan, Elaine Purdue, Helena Foster, Janet Little, Luke Corcoran, Lynelle Colleran, Niamh Sweeney, Nicola Whelan, Sarah Thunder and Vladutz Varlan who are presenting their work or favourite monologues, scenes, improv’, reading, in preview or in production. Caroline Grave-Cassidy’s new book “The Importance of being me” will be launched in Dubray Books. What exactly is sound? What role does it play in our lives? In this talk you will be introduced to sound as a measurable physical quantity and discover how our experience of sound is shaped by biology and perception. Paradoxical effects and strange mysteries of sound will be explored by demonstration and through listening sessions. The talk is suitable for all ages. Basic physics will be assumed, but no mathematics will be presented. Admission is free but registartion is required via the website below. The Dublin’s Theatre Club Cervantes will perform the comedy play “Gooal!”. Having presented scenes with sadness and drama as a backdrop in previous shows, this period the group will concentrate on forms of discourse based in humour, irony and amusement. The club will focus its work on comical, absurd and hilarious situations with the hope of making its audience smile or laugh at loud. Under the direction of Sandra Lee Villegas (The Latin Sphere Theatre), the Theatre Club presents Gooal!, a play written by Luis Jaraquemada Bueno, which intertwines four stories that happen during the 2010 World Cup Final in South Africa in which Spain played Holland. American poet Teri Ellen Cross Davis and Irish poet Jane Clarke read from their recent collectons at Poetry Ireland. The Clockworks will be in Sin E for a gig. The Shoos will play Soulful Rock ‘n’ Roll in the Harbour Bar. SOMA originated as a series of house parties in Dublin hosting bands and DJs and the SOMA Clubnights (last Thursday of every month) in Whelan’s carry on the house party tradition just in a proper music venue. On Thursday Indie-Pop/Rock band “Young Earth” will play a gig and it will be followed by DJs. The Square Pegs will play Chicago blues, 1950s R&B and New Orleans blues at this gig. Clarksville, Jim Loghran, Ronan McCauley, Ruth Egan, Rebecca K, Callum Keaveny. The band Headsup around guitarist Gerry Hendricks, will play a gig in the Patriot Inn. Admission is free. Playing Motown and Soul from the 60s, the Motown Tribute Band “The Dionnes” will play a gig in the Bowery. Next Summer will be in 40 years!? Last Wednesday (21 June) was the hottest day of the year, when Met Eireann measured 28.6 degrees in Phoenix Park. The whole week, or 5 consecutive days, was 5 degrees warmer than normal and if that happens, it is called a heatwave. For me, it was just a nice warm summer week. because summer temperatures for me START at 20 degrees. But if you are used to the cool 16-18 degrees that Ireland normally gets at this time of the year and if your thermostat is set to that low level, than you were probably melting in the current weather. Gerard Fleming, the head of forecasting in Met Eireann explained that the last time such a heatwave hit Ireland was 40 years ago, So will it take another 40 years until we have a proper and nice week of summer again? Unfortunately the heatwave came to an end for now and there is no promise and certainly no guarantee that there will be another one soon. But wasn’t it great while it lasted!? By the way, did you know what the highest ever temperature was in Ireland? On 26 June 1887 the temperature of 33.3 degrees was measured in Kilkenny. 33.3! That’s not a lot at all. Where I am from in Germany (not Spain, or Italy or Morocco. ;-) ) this is a NORMAL summer temperature!